Sky Carter is a Sydney based fibre artist who has spent most of her life experimenting, exploring and dabbling with various creative mediums. Sky says; “I never really knew what I wanted to be when I grew up and I spent a lot of time trying different things, I was a bit lost and I always seem to be searching for the next evolution point”. She recently found her passion in free-form weaving which she now pursues full-time at her studio in the May Street Artist Studios, a thriving artist community. Sky is influenced by colour and design trends and enjoys the insidious and influential nature of popular culture. She draws inspiration from the design community and likes to casually observe cultural movements and global happenings. However her most powerful influences and motivators are internal. These stem from a need to seek and provide comfort as well as a need to nurture, she likes her works to be soft, warm, evocative and inviting. 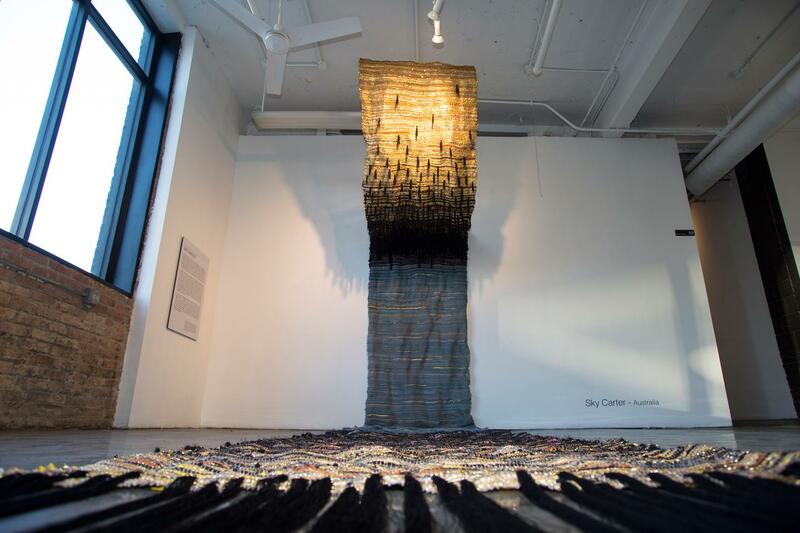 Sky loves the textural sculptural effect which weaving achieves and in her practice she continues to explore this element. Her process starts with collecting materials from various places and especially loves repurposed, recycled and revived materials. Sky says; “There is something quite potent about finding a stash of yarn that obviously belonged to someone who has passed on. It’s magical to give that person’s hobby a life again.” She uses various looms to produce her works, from sophisticated models to hand made makeshift cardboard looms. In the studio, she'll create colour and texture palettes from what she's gathered and then begins allowing the work to evolve organically. Sky shares her love of weaving with others through conducting Free-Form Weaving workshops across Sydney. She teaches her weaving style which she has developed over time (a more expressive, free and intuitive way of weaving using a mix of materials) and encourages her students to explore. Sky says; “It’s a very gratifying experience holding the workshops, people get so excited when they see how achievable the process of weaving a wall hanging is and how many different looks can be produced using only a few simple techniques. Plus I always learn something from my students”. Sky has also developed her own range of weaving tools. 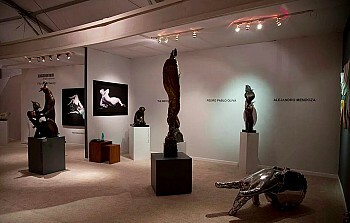 Since 2012 Sky has exhibited her works in several group shows and art fairs. Along with a fellow fibre artist Sky runs a Fibre Art Collective as an avenue for fibre artists to exhibit their works and gain exposure as well as increasing awareness if fibre art as an art genre. Sky completed design studies at ISCD (International School of Colour and Design) and is continually developing and evolving her skills.